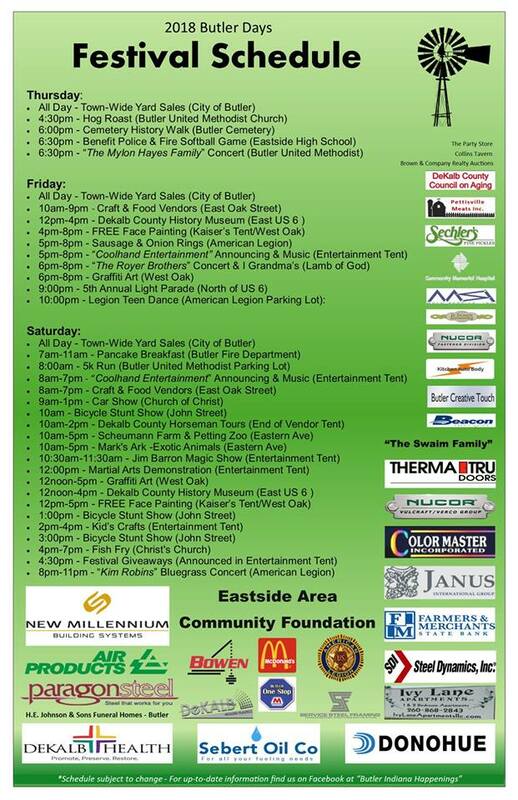 Butler Days Festival is a three day event celebration of the cultural and historical heritage of the Butler community! 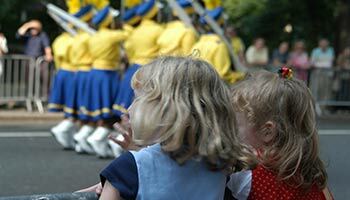 Celebration begins on Thursday with a Hog Roast and live music by "The Mylon Hayes Family". There will be a Police & Fire departments' benefit softball game, a cemetary history walk and ALL day town-wide garage sales! Friday brings the best craft & food vendors, ALL day town-wide garage sales continues, games/contests, more live entertainment, museum visits and in the evening the annual Light Parade followed by the Legion's Teen Dance! Saturday's events you will not want to miss starting with the Fire Dept. 's Pancake Breakfast and a 5k Run! There will be ALL day craft & food vendors, ALL day announcing & music in the Entertainment Tent and the ALL day town-wide garage sales continue! The day is filled with so many exciting kids' (& adults) shows & activities: three Bicycle Stunt shows, a magic show, car show, martial arts, graffiti arts, horse drawn wagon tours, AND Mark's Ark and Scheumann's Petting Zoo will be there. Click on the Festival Schedule below for exact times and locations! All of this AND a FISH FRY, festival GIVEAWAYS, and live entertainment with a bluegrass concert by "Kim Robins" to finish out the evening! Don't miss a minute of it!!! !